Why Is This Cat Smiling? He’s happy because his “mom” won a 2009 VegNews Veggie Award! Gary was so excited about the news, he even took a break from playing in his cat tunnel to read all about it. I’m truly honored to receive this special recognition for my work. It came as a total surprise, with the news being delivered to me by a phone call from VegNews publisher, Joe Connolly, himself. Talk about making my day! Be sure to see the complete list of 2009 Veggie Award winners in the November+December issue of VegNews Magazine. Photo Op: If you want to see some yummy-looking photos from 1000 Vegan Recipes, go to Vegan Appetite and check out the 10/26 post. Tami was a tester for this book and has posted several photos of the recipes she made from it. Thanks, Tami! 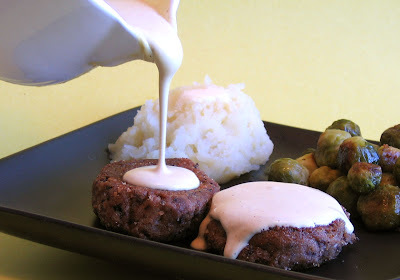 I might as well face it, I’m addicted to the Hollandaze Sauce from 1,000 Vegan Recipes. So far I’ve used this sublime, creamy, decadent, delicious, lemony sauce on baked potatoes, roasted asparagus, roasted cauliflower, Soy-tan Dream Cutlets, and my current brunch favorite, Burritos Benedict. 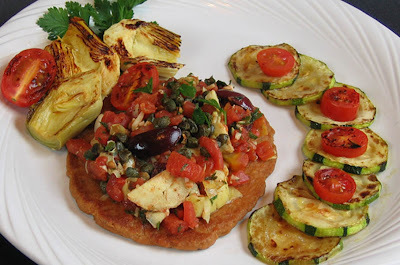 As seen in the photo, I’ve also used it to top Cashew-Chickpea Medallions. This silky sauce is best made in a high-speed blender for the ultimate in creamy smoothness. It’s very easy to make and a great way to dress up a meal. As I do with everything I cook, I always taste what I’m making as I prepare it, to be sure of the balance of flavors. The danger with tasting this sauce as you make it, is that you’ll want to keep on tasting it until there’s barely enough left to serve for dinner. This recipe is from my new book, 1,000 Vegan Recipes, published by John Wiley & Sons. In a high-speed blender, process the cashews to a fine powder. Add the nutritional yeast, water, lemon juice, mustard, salt, turmeric, and cayenne and blend until smooth. In a small saucepan, melt the margarine over medium heat and add to the cashew mixture. Blend until smooth. Serve as is or return the sauce to the same saucepan and heat, stirring, over low heat. I dream of Soy-tan Dream Cutlets. Well, okay, maybe I don’t actually dream about them, but I sure like to make them for dinner. In fact, they’re among my favorite recipes in 1,000 Vegan Recipes. Made by combining vital wheat gluten and extra-firm tofu with seasonings, the resulting cutlets are more tender than regular seitan and firmer than tofu. Quick and easy to make, these cutlets can then be used in a variety of recipes that feature seitan, tempeh, or extra-firm tofu, such as sautés and stir-fries. I like to cook up a batch and keep them on hand for those nights when I want to get a great meal on the table — fast. The other night, I used them instead of regular seitan to make the Pan-Seared Seitan with Artichokes and Olives from 1,000 Vegan Recipes. I grabbed some cutlets from my stash in the refrigerator, pan-seared them, and then kept them warm in the oven while I made the topping, a quick sauté of garlic, diced tomatoes, and sliced artichoke hearts, with black olives and capers. (The recipe is below.) In the book, I suggest an optional topping of vegan feta, but I didn’t have any on hand, and the dish was delicious without it. Since I had pan-searing on the brain, I also seared some sliced zucchini along with a few halved artichoke hearts and grape tomatoes to serve with the cutlets. 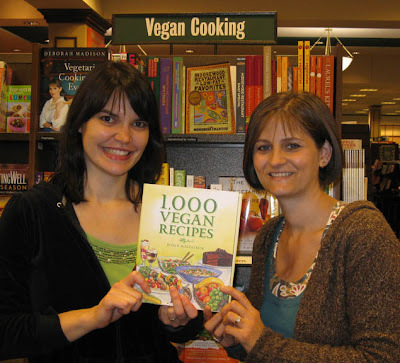 Book Giveaway: A copy of 1,000 Vegan Recipes is being given away on the blog at vegcooking.com. The deadline to enter the contest is November 4th and the winner will be chosen at random. New Blog Alert: I just found out about a new blog called “Cooking from 1,000 Vegan Recipes: six vegans, one book, one blog.” Tune in as these six bloggers cook their way through 1,000 Vegan Recipes — it’s kind of like “Julie and Julia” — only better cuz it’s vegan! Check it out. This recipe is adapted from 1,000 Vegan Recipes. The original recipe calls for regular seitan, but this time I used Soy-tan Dream Cutlets (also from the book) instead. You could substitute tempeh or extra-firm tofu, if you prefer. Add a few shakes of red pepper flakes if you want a little heat. 1. Preheat oven to 250°F. In a large skillet, heat 1 tablespoon of the oil over medium heat. Add the cutlets and brown on both sides, 3 to 5 minutes per side. Transfer to a heatproof platter and keep warm in the oven. 2. In same skillet, heat the remaining 1 tablespoon oil over medium heat. Add the garlic and cook until fragrant, about 30 seconds. Add the tomatoes, artichoke hearts, olives, capers, and parsley. Season with salt and pepper, to taste, and cook until hot, about 5 minutes. Set aside. 3. Arrange the cutlets on plates and top with the vegetable mixture. Serve hot. Last night’s dinner was a wealth of autumn vegetables: buttercup squash, sweet potatoes, Savoy cabbage, carrots, and onion, all cut into large chunks and roasted together until crisply browned around the edges and tender-sweet inside. I made more than we could reasonably eat at one meal, so for today’s lunch I decided to use the leftover vegetables to make fritters. They’re so quick and easy to make. Just chop up the cooked vegetables and place them in a bowl. Sprinkle them with all-purpose flour (about 1/3 cup) and season with salt and pepper to taste. I didn’t add any additional herbs or spices because the cooked vegetables were already seasoned, and I wanted their flavors to come though without other influences. After shaping the vegetable mixture into patties, fry them in a little oil until browned on both sides. That’s all there is to it. I served them with a lightening-quick applesauce I made by shredding a few apples with a box grater and combining them in a saucepan with a little sugar, cinnamon, and a splash of lemon juice. I cooked the applesauce for no more than five minutes, just long enough to warm through and allow the flavors to combine. The applesauce tasted great with the fritters which were delicious and so gorgeous—the colors of the different vegetables in the fritters reminded me of the vivid autumn leaves gracing the trees this time of year. On 10/9, 1,000 Vegan Recipes was a staff pick on VegNews Magazine’s This Just In. On 10/7, the book was also recommended by Erik Marcus on Vegan.com. 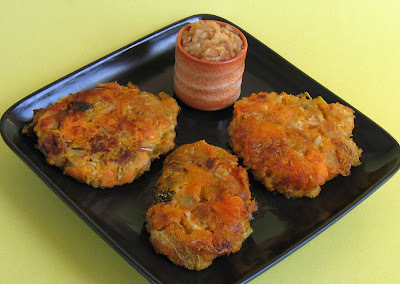 Also on 10/7, Jenn, of Vegan Dance If You Want To, did a post about one of my favorite recipes in the book, the Soy-tan Dream Cutlets. Made with both tofu and wheat gluten, these tender and tasty cutlets can be used in your favorite seitan or savory tofu recipes. Apple season has descended upon the Shenandoah Valley and every fruit stand and farmer’s market is bursting with bags, boxes, and bushels of crisp, beautiful apples in more varieties than I can name. I brought home more than I can easily use, but I’ll try my best. Applesauce and baked apples are definitely in our future, and I’ll soon be baking Jon his favorite apple pie. Personally, I enjoy apples when they’re combined with savory foods such as roasting chunks of apple with carrots and potatoes to serve with a seitan roast, or sautéing sliced apples with cabbage, onion, and vegan sausage. 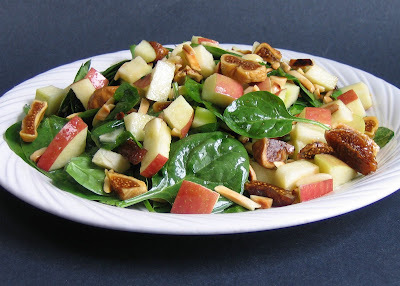 Apples are also a great addition to salads, like this spinach salad that combines a chopped apple with figs and toasted almonds tossed with a light vinaigrette. You can use any kind of apple you like in this salad and walnuts or another nut can be substituted for the almonds. I love the way the varying textures and flavors in this salad play off one another. It’s a great salad for these autumn days when the weather’s still warm enough that a refreshing salad seems like a good idea, but you want one that’s satisfying enough to remind you that it’s autumn. This simple salad is easily tweaked to suit your tastes. For example, you can use mixed greens instead of spinach or change the ratio of greens to the other goodies — some people like more greens, others prefer more fruits and nuts. Instead of the figs you can use dried cranberries, and of course, whatever variety of nuts or apples you prefer. For a heartier salad, you can top it with some chopped vegan bacon or smoked tofu. The recipe is in my new book, 1,000 Vegan Recipes, published by John Wiley & Sons. In a small bowl, combine the oil, vinegar, sugar, and salt and pepper, to taste. Blend well and set aside. In a large bowl, combine the spinach, almonds, and figs. Add the apple along with enough of the dressing to coat. Toss gently to combine.